Posted by huntthepoem in find. It was a chilled and blustery afternoon on the Castle esplanade. Yet a dedicated team of poem hunters, the bravest of the bunch, turned out to meet with the ghost of Elizabeth Galbraith herself. They all discovered the line at the same time, and it was a race to the Poetry Library — but only Margaret Forrest had thought to bring her bike. Write the lines o your ain life, for now I am done. We have already received enquiries from Lothian & Borders Police about Margaret’s availability over the next year — apparently they have several unsolved cases which need her attention. It was the longest-running puzzle and we feared it would never be found. But Chris Scott followed a long and windy trail, pursuing the spirits of dead poets through publications and coffee shops to, finally, bring line 1 home to the Poetry Library on Saturday. Allegedly Chris is considering leaving photography to embark on a new career as a private eye. Two days to go before Hunt The Poem wraps up. Hannah Cornish sat down, put her head in a book — several, in fact — and recovered line 9. You can still hunt line 9 yourself for fun but the prize is gone! Why not concentrate on Line 1 instead? Mondays seem to be charmed. Joe Halliwell surveyed the city from space, traversed some winding closes and discovered Line 5! You can still hunt line 5 yourself for fun but the prize is gone! Why not try Line 1 or Line 9 instead? Nobody can say Martin Ramsay had an unproductive weekend. He braved protest marches and police roadblocks to entertain us with some Spike Milligan verse on Saturday afternoon. Little did we know he had already made some new friends across the globe — by sheer determination — and he carried two poems by post to bring home Line 10. You can still hunt line 10 yourself for fun but the prize is gone! Try another line instead? And the lines are coming in thick and fast. This makes the third discovery this week so far! Daniel Winterstein got out and about in amongst some weighty tomes and found line 4 of the poem. You can still hunt line 4 yourself for fun but the prize is gone! Try another line instead? The mighty Margaret Forrest has done it again, bringing in Line 6 and then Line 11 to the Poetry Library in one day. Margaret put herself in the picture to rub shoulders with the poets of the past, constructing her own trail of photographs. She eventually tracked down modern poets Nick MacDonald and Willie Gibson to assemble Line 6. Line 11 was all about communication. Margaret needed help from her mother Catherine Petzsch and her husband Ian Forrest to solve a crossword with one clue missing. This led her to pull a missing line literally out of the air. You can still hunt line 6 or line 11 yourself for fun, but the prizes have gone! Try another line instead? 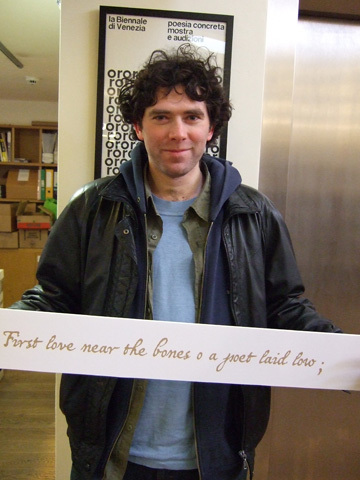 We love nothing better on a Saturday afternoon than the discovery of another line of the poem. 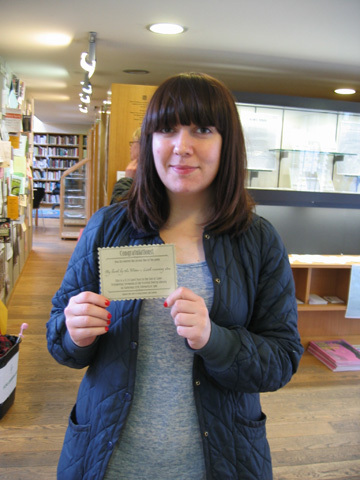 Gemma Steele completed the geocache challenge and brought in line 2 of the poem. You can still hunt line 2 yourself for fun but the prize is gone! Try another line instead? We’re over the moon at Hunt The Poem HQ this morning — a second line has come in within minutes of the first. Margaret Forrest had a weekend of culture and discovered line 7! You can still hunt line 7 yourself for fun, but the prize has gone! Try another line instead? We couldn’t ask for a better way to start the week — a line of the poem has turned up safely! The Forsyth family and Alan Wrench searched a certain location just outside the city centre and discovered line 8 in a bottle! You can still hunt line 8 yourself for fun, but the prize has gone! Try another line instead?